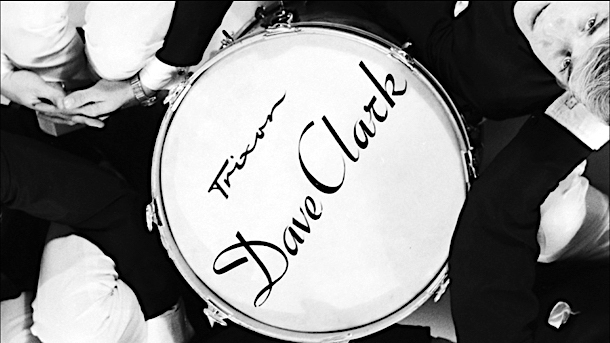 David ‘Dave‘ Clark was very much part of my North London Music scene in the sixties, to the extent that eventually he lived just a mile or so from me in Southgate N21, in a house called ‘The Drum’. He was born on December 15th, 1942, although if you search you may find that other years appear to be available on the internet, including 1939. I’m putting him in ‘Groovers and Shakers’ but I’m not actually sure whether, because of everything he’s done as an entrepreneur and an ‘angel’ since his drumming days, he really should be included in our occasional series ‘Something Else for the Weekend’. Dave has done what a great many other drummers haven’t – make money. And rather a lot of it! Dave Clark was born in Tottenham and lived in Philip Lane in his formative years, which is not too far from the Spurs ground: White Hart Lane. He’s always been known as an English musician, songwriter and record producer; but perhaps he should be better-known for being an impresario, who it seems has effortlessly managed his own destiny. 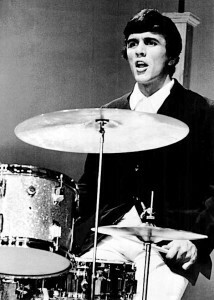 He was the undisputed leader of The Dave Clark Five, as well as being their drummer. The Dave Clark Five, sometimes known as The DC5 (although not to be confused with a version of Honda’s Integra) were the first of the British Invasion bands to follow in The Beatles’ giant footsteps into the biggest market of all – America. This was in 1964. However, before all his fame and subsequent fortune he left school as early as he legally, could at the age of 15, without any qualifications. He was highly motivated though and made his way into films, becoming firstly an extra, then a stuntman, and evidently performing in over 40 films. He was streetwise and self-confident, and well on his way to becoming the shrewd businessman whose fortune would be built on deals he negotiated when he was just 20 years old. He also found time to become a black belt in Mixed Martial Arts, which must have helped in his stuntman activities. 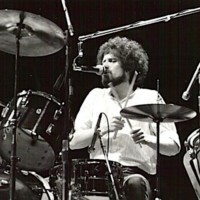 To begin at the beginning, his drumming career was launched in his local gym in a mid-fifties skiffle-group (like all of us at the time playing Lonnie Donegan songs). The group was composed completely of Tottenham Hotspur supporters like Dave. This was a time when 50% of the young guys in our pocket of North London were Spurs fans and the rest weren’t. It’s my guess that consequently his band will have played “When The Saints Go Marching In” in their repertoire. Actually Dave and his guys were doing gigs and struggling to raise money so their amateur team could play football in The Netherlands. Like many of us Sixties drummers, I’m guessing Dave started out on the washboard and from there graduated to a drum kit – of sorts. His was bought for £10 and evidently had a bass drum which he is on record saying was as big as he was. He taught himself to play them, and that skiffle group grew into The Dave Clark Five with Dave their leader, co-songwriter, manager and producer. The group eventually comprised local boys: Denis Payton, Mike Smith, Rick Huxley, Lenny Davidson and Dave Clark. 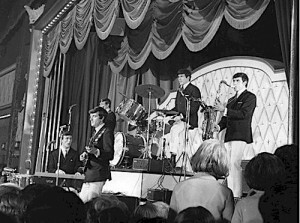 By this time the band had moved on to playing rock ‘n’ roll and had found their way onto The lucrative Mecca dance-hall circuit and are said to have played to audiences of 6000 enthusiastic dancing punters each night – often at their local, ‘The Royal’ in Tottenham. They also played in US bases in England. “To my amazement, they let me get away with it,” he said. EMI also inexplicably allowed him to retain the more lucrative American rights to their recordings. “They never looked at longevity in those days – it was all about making a quick fortune. Nobody thought that the music boom of the Sixties was going to last”. Anyway, it was important for Dave to keep control. When EMI surprisingly acquiesced to his demands, he found himself in a position to call all the shots. Unusually for that time he was producing the records himself and therefore having to pay for his own studio time. However this meant that, unlike The Beatles; he didn’t spend endless hours (and lots of recoupable record company money) composing and scintillating in the studios. If a song wasn’t done in two or three takes they’d leave it and nip down the pub rather than waste money ‘polishing’ it. They’d come back later and finish the job and the completed records would eventually be leased to EMI – but would remain his property in perpetuity. 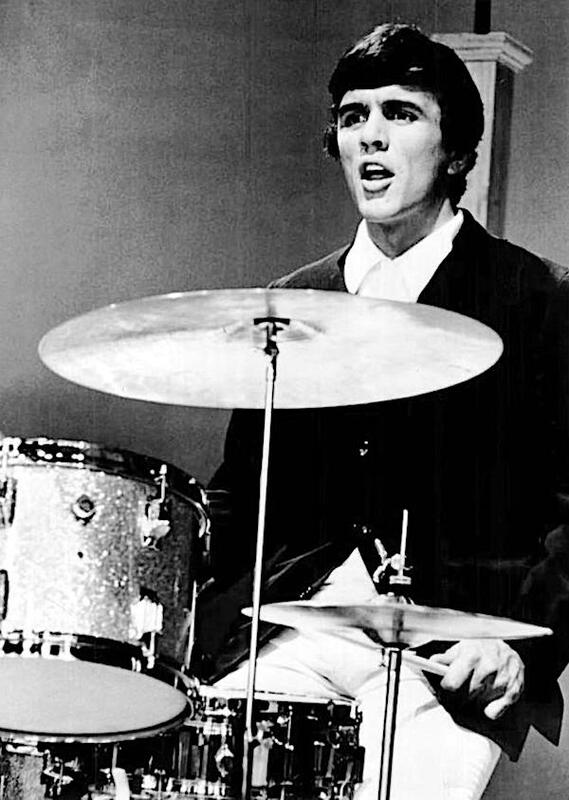 There was something which Dave was not quite so famous for, something which remained a secret for many years: he was not the drummer on the Dave Clark Five hits – Bobby Graham was! This was something which now seems completely unimportant and irrelevant, but was denied for years. Eventually though Bobby let it slip saying that since Dave wanted to be up in the box producing and he couldn’t do that and be down in the studio playing at the same time – which was very sensible! 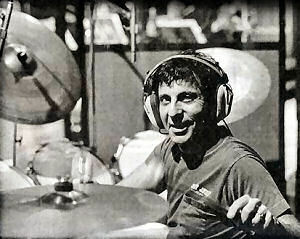 However he didn’t want any complicated fills to be played on the tracks which would be difficult for him to play live. Bobby told me he was on all the hits, but that Dave played on album tracks. The band broke up in 1970. 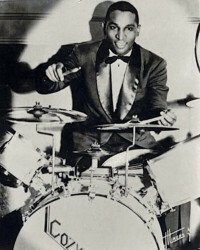 In 1972 Dave Clark stopped drumming for good after he broke four knuckles in a tobogganing accident. Dave by this time had taken control of all the group’s business interests: the publishing of their songs under the banner of ‘Spurs Music Publishing Ltd’ (named after his favourite football team) and rights to their TV appearances, including the group’s 18 performances before audiences of 60 million on The Ed Sullivan Show in the U.S.
Years later, he acquired the rights to ITV’s ‘Ready, Steady Go’ music TV series. And with the group’s music enduring and the royalties continuing to roll in, plus income from some very shrewd investments, he was doing rather well! But come here, there’s more to add to his portfolio. He wrote a science fiction musical for the stage called ‘Time’ which began in 1986, ran for two years in London’s West end using a hologram of Sir Laurence Oliver. It starred Cliff Richard, who was eventually replaced by David Cassidy. The musical launched a concept album which featured Cliff, Freddie Mercury, Leo Sayer, Stevie Wonder and Dionne Warwick. Two million copies were sold. Dave Clark has become a highly successful entrepreneur and as a consequence a multi-millionaire. He owns a house in London worth £12 million formed from several identical terraced houses with all their adjoining walls knocked through – a bit like the Beatles scene in what I hope I remember accurately as being “A Hard Day’s Night”. As we discussed, from the very beginning he owned the rights to all the Dave Clark Five music masters and in 1993 he released remastered versions of all their singles on a CD called “Glad All Over Again”. In the late 1960s, in addition to managing his band, he began directing and producing for television. 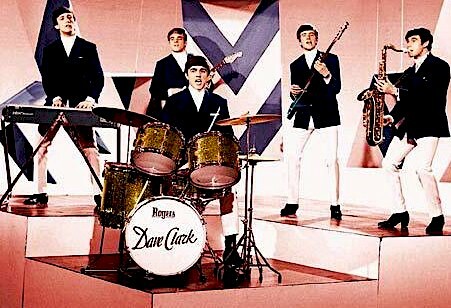 In 1968 he made a television production called, ‘Hold On, it’s the Dave Clark Five’. 50 years after the founding of the band, it was inducted into the Rock and Roll Hall of fame and the surviving members were there to experience the honour. In 2015 Clark wrote, produced, appeared in, and partly presented a 115-minute long documentary –‘The Dave Clark Five and Beyond: Glad All Over’. 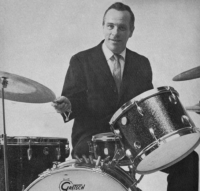 He was famously an endorser of English Rogers drums and their red glitter ‘Londoner 5’ set was named with him in mind It was ahead of its time with two mounted toms, albeit Dave’s were set up arguably the ‘wrong’ way round with the largest tom on the left. As far as cymbals were concerned I’ve seen pictures of what look like Ajax which would make sense because they were mad by Boosey and Hawkes who made English Rogers. 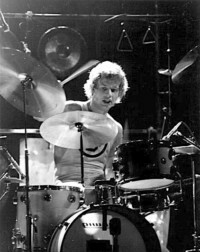 Mind you he should have been turned on to Zildjian once he arrived in America. 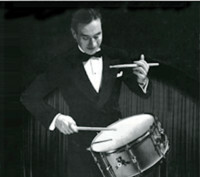 He certainly did use other drums and I’ve seen photos of him with American Rogers and of course the Trixon ‘Luxus’ he was playing when he first came to the public’s attention. The last time I bumped shoulders with him was in the green room at a dancing extravaganza he was involved with along the lines of ‘Riverdance’. And since we were sitting together I seized the moment to try to buy one single use of a piece of film he owns of Moonie destroying his Premier kit on ‘Ready Steady Go’ but, I’m afraid he wasn’t having it! He was brought up in the Church of England but these days it seems he’s more attracted to the powerful, non-violent Buddhist philosophy. I think it’s safe to say, that as far as Dave Clark is concerned, it certainly was never just about paradiddles!